This lovely colour has no name. Pity. I might have called it Boysenberry. I like that name and I don’t know a lip colour with that name 😛 There is no shimmer and its not super high gloss either. Its pretty much just. right. 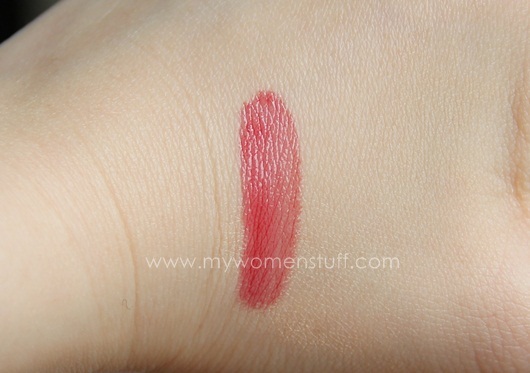 And here’s the swatch for Glazed Lips L303. Just one swipe mind you. This is lovely pigmented stuff that is not heavy nor goopy nor opaque and thick. Its not glossy or shiny despite the name “Glazed lips” but it gives a gorgeous tint of colour that you can build up to a beautiful opacity that doesn’t look overdone, or leave it as a sheer wash of colour on your lips. I love wearing this one everyday and I do! 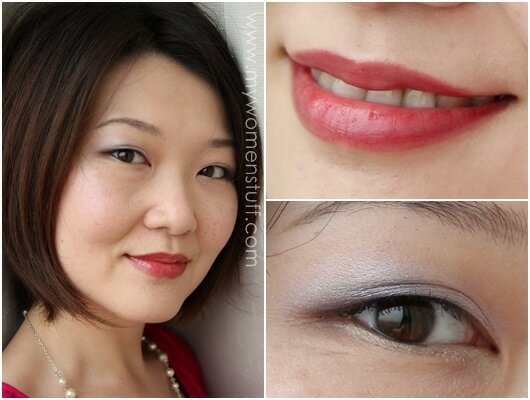 Layered a couple of times when I want something heavier on the lips and just 1 swipe when I don’t want to be too bold. The colour is as you see here. A pink-red I honestly believe anyone can wear and wear well. Longevity is excellent. It takes me through to lunch looking good despite copious amounts of coffee and water and I usually do a quick touch up if I need it to look good thereafter. 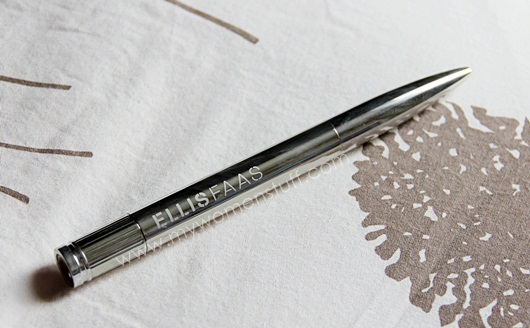 Ellis Faas eyeshadows may have bummed me but the Glazed Lips formula is a winner! I had to include this shot of the Inglot eyeshadow beceause I have to let you know how much I love the formula and how impressed I am by it! The problem is, Inglot eyeshadows come in numbers (brain freeze!) so I cannot remember them as well as I do names. What I can tell you is that it is a light shimmery pink (possibly 431P) layered over a deep purple from the palette I showed you last week. Bottom lined with gold (AMC45S) from the other palette. Eeeeks, PB, you make me wanna own a pen like that too!!! I’ve been stalking the site for a few times now. The pen is awesomely cool. I love it! 😀 Ooh you got you some Shiro eyeshadows! I have been contemplating them but the thought of dealing with baggies/sample pots just puts me off even if I know they would look awesome. Will wait for you to get it and report back! Yes the price IS a huge deterrant 🙁 Still that’s the thing about the exclusive nice quality stuff eh? The colour is lovely! The texture looks light and yet the colour is opaque! I would love to get one of these too, but the price and availability is such a turn off 🙁 How much did u pay for the shipping? Sadly I have to agree with you on all counts. I utilized a free shipping code but otherwise shipping is flat rate of $ 7,50 / € 6,50 / £ 5,50 worldwide. you look great in pinky reds! The lip color is so lovely on you! and the inglot eyeshadow looks great too. One of these days , I must go to Inglot and check them out. Yes do check Inglot out. Their eyeshadows blow me away! oh btw, STAGE cosmetics is having their sale, 2 lipsticks (exp date Aug 2012) for RM20. 2 nail polishes for RM12. Lovely! So checking this out at Mecca Cosmetica when I go back to Australia. Wow that color is gorgeous! I”m going to NL soon, *hopefully* i’ll be able to pick it up in store. I am happy to hear that you loved Inglot shadows, I’ve been using the brand since my teen years. 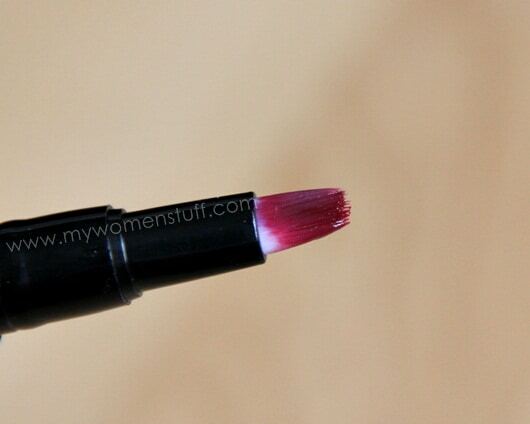 And I love the name you gave to this EF lipstick; it looks really nice on you! Inglot shadows are pretty amazing 😀 I’ll have my post up soon! Gosh, I am so jealous that you are so tiny, yet your face does not have that gaunt, hollowed cheek look 😀 Wish I could inject some of my thighs into my cheeks!!! Anyhoo, love the lippy! Does’t it feel drying that you have to apply some gloss on top?